Ridley-College lecturer John Dickson has recently returned from a trip to Jordan and Lebanon looking at the role of Australian Aid and he’s making no attempt to downplay the deep impact the experience has had on him. 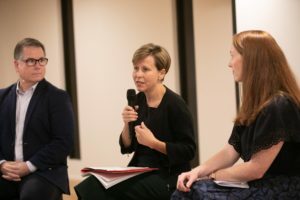 “I was always, you know, an advocate for Australian Aid, but it was sort of like that thing where we all know we’re meant to be vaguely healthy and then you have a heart attack and so you are bought powerfully into emotional alignment with what the facts always were,” Dickson told attendees at an event about being a good global neighbour by Micah Australia and Anglican Deaconess Ministries in Sydney. 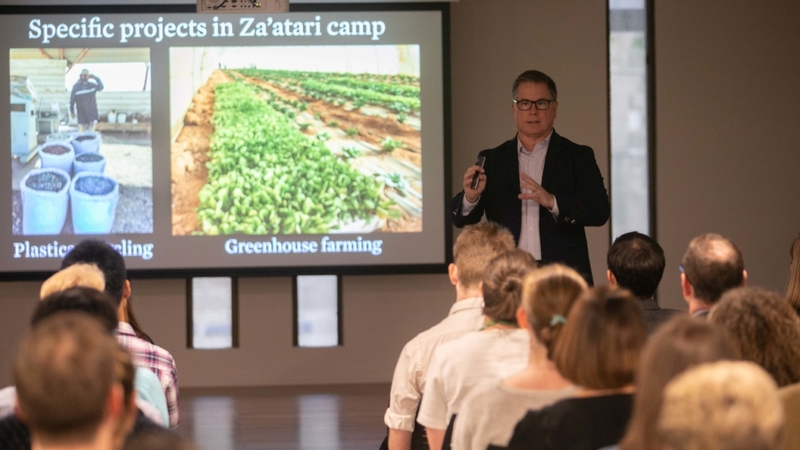 Dickson opened the event by taking attendees through a photographic presentation of the different projects he’d visited, including Zaatari refugee camp in Jordan, noting details of the aid programmes and sharing the stories of the people they reach. He told the audience he was especially struck both by the professionalism of those delivering projects funded by Australian Aid and the protocols in place to ensure the funding’s stewardship. Yet even more striking to him was just how effectively the small Australian aid budget is in making a real difference to people’s lives. “Currently 0.22 per cent of gross national income goes to Australian Aid. Twenty-two cents in every hundred dollars of revenue. It’s not a lot. Yet if you think of the average Australian full-time worker, that means that $158 of the tax they’ve paid is going to serve the needs of very vulnerable people. Which is just four hours work,” Dickson said. “Man, I’ll do eight hours work to send that back! I really will. 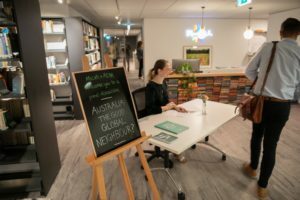 ‘Cause when you think that that contribution of $158 — four hours work for the average Australian worker — is four months’ food for a Syrian refugee, or a full year of schooling…” he trailed off, his point clear to all in attendance. The evening focused on what it meant for Australia to be a good global neighbour and included talks by Labor Senator Jenny McAllister, Anglican Deaconess Ministries CEO Kate Harrison Brennan* and a panel with all three speakers fielding questions by Micah’s Matt Darvas and the audience. Liberal Party Senator Michaelia Cash was unfortunately unable to attend at the last minute. Senator McAllister acknowledged the work of churches in advocating for Australian aid. Darvas asked the panel what they believed being a good global neighbour meant for Australia. “I think the challenge for us as Australians to be good neighbours is to look at ‘Well where do we spend our money?’ and coming up to budget season there’s no better time to think about that. “I’d love us to actually challenge ourselves and to challenge the government in thinking about how do we give love to our neighbours in a way that’s not just some equivalent of a lamington drive (with charity). How do we actually give richly from what we’ve been given?” Harrison Brennan challenged the crowd. Senator McAllister said she thinks there’s a big conversation going on at the moment which is a “push and pull between hope and fear” both domestically and the ways we think about our region in the Asia-Pacific/Indo-Pacific. “Right now we are in the middle of this rapidly changing place and disruption can provoke fear – lots of people don’t like change. But there’s so much to be optimistic and hopeful about in terms of our region – many people emerging from poverty, many communities emerging from poverty into education, looking for engagement with us. So many opportunities for Australia to learn from our neighbours. The second, Dickson said, is God’s own “self-giving love” which he described as “the centre of the Christian faith”. *Kate Harrison Brennan is a member of the Bible Society Australia’s Board.